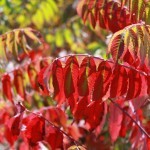 A large, suckering shrub with deep green foliage that turns brilliant red, orange, and purple in the fall. Yellow clusters of flowers develop into cones of scarlet fruit in the later summer. Very heat and drought tolerant. It prefers full sun to partial shade in a well-drained soil. 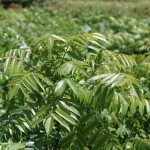 It may be used for mass planting, to stabilize an embankment, or naturalized areas.